The name of the Lord is awesome, holy, full of glory, trustworthy, worthy of thanks, worthy of praise, worthy of blessing and is the highest name in all eternity. The Lord guards His holy name jealously. ‘I will be jealous for My holy name’ (Ezekiel 39:25). We know the Lord is perfectly holy above all the things He has created but His name is holy too. His name represents Who He is in a similar way our reputation represents who we are. If someone were to slander our good reputation, we would attempt to put right what an unthinking person has done wrong. We would defend ourselves and clear our name. That is what the Lord does. He holds His name and reputation in high regard. ‘I had regard for My holy name’ (Ezekiel 36:21). ‘I will sanctify My great name’ (Ezekiel 36:23). ‘Every grain offering you will season with salt. You will not allow the Salt of the Covenant of your God to be lacking from your grain offering. 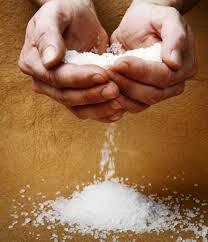 You will offer salt with all your offerings’ (Leviticus 2:13). ‘All the offerings of the holy things the children of Israel give to the Lord, I give to you and your children with you forever, a Covenant of Salt before the Lord for you and your children with you’ (Numbers 18:19).